This analysis is an excellent example of how an analyst can develop a robust predictive model with a lot missing data. In this analysis I explore how age and gender predict strong social ties over time. Strong ties are important because during a life event (such as a death in the family or a divorce) a person’s ability to get through the crisis can depend on close family or friendship ties. 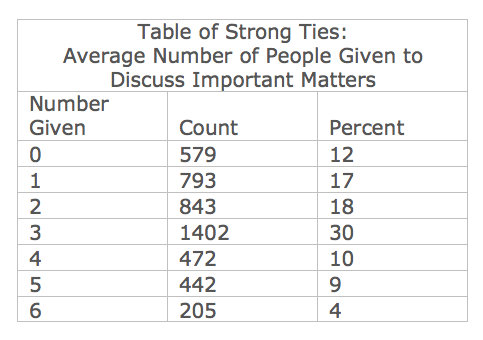 Results from the General Social Survey showed that on average strong ties among Americans between 1985 and 2004 decreased by close to one-third. These findings imply that people are becoming more socially isolated. 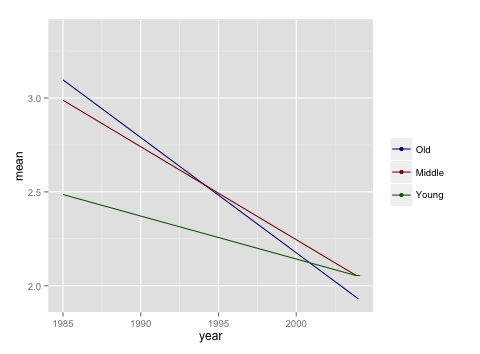 Based on these findings, I used regression modeling to explore the extent of this change. From time to time, most people discuss important matters with other people. Looking back over the last six months, who are the people with whom you discussed matters important to you? 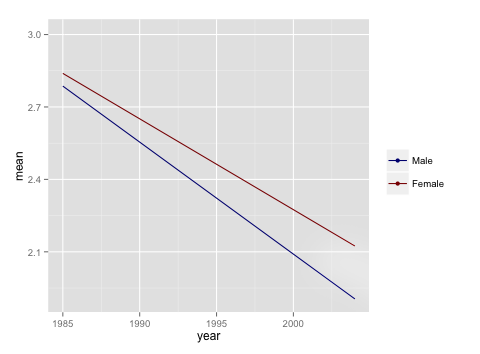 The regression model shows that in 1987 the average number of strong ties decreases by 0.45 compared to 1985, and decreased by 0.94 in 2004 compared to 1985. The regression model shows that for every year, from 1985 through 2004, the average number of strong ties decreases by 0.04 every year. 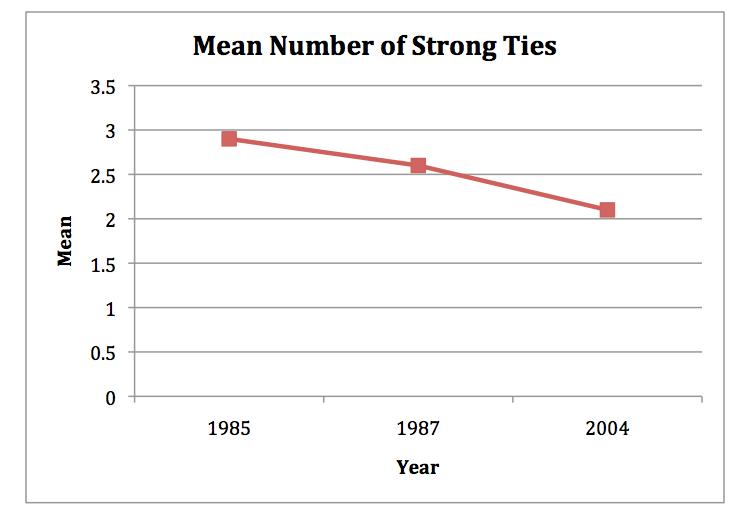 For a yearly increase in age, strong ties decrease by 0.01. On average, women have 0.12 stronger ties than men. To understand how strong ties change over time based on cohort, I modeled age as a categorical variable and interacted it with year. The young cohort was defined as a participant between the ages of 18 to 30, middle between 30 and 50 and older as 50 and above. The results show that as year increases, all cohorts became more socially isolated but it varied according to age. The young cohort on average experienced a -0.06 reduction in strong ties per year. The middle cohort on average decreased by -0.11 per year and the older cohort by -0.55 per year.